The armed forces are having a tough time attracting new recruits lately, in no small part due to the mess in Iraq. 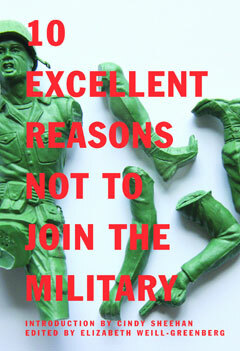 Young people are getting wise to the many excellent reasons not to join the U.S. Military, and this handy book brings them all together, combining accessible writing with hard facts and devastating personal testimony. Contributors with firsthand experience point out the dangers facing soldiers, describe the tricks used by recruiters, and emphasize that there really are other options, even in a sluggish economy. It’s essential reading for anyone thinking of signing up.